Gaskells Waste is dedicating the whole month of October to raising money for homelessness charity The Whitechapel Centre. We’ve been working in partnership with the Liverpool based charity for the past year to raise awareness of the dangers of homeless people sleeping in bins, along with financially supporting them. Gaskells have already taken part in a number of fundraisers, including last years Liverpool Sleepout, and our Commercial Director Denise and Sales Manager Gary being locked in ‘jail’ alongside other prominent business leaders. With winter now well and truly on the way, when people on the streets are more at risk, the whole team at head office has decided to step up their efforts, with a full four weeks of fundraising activities. 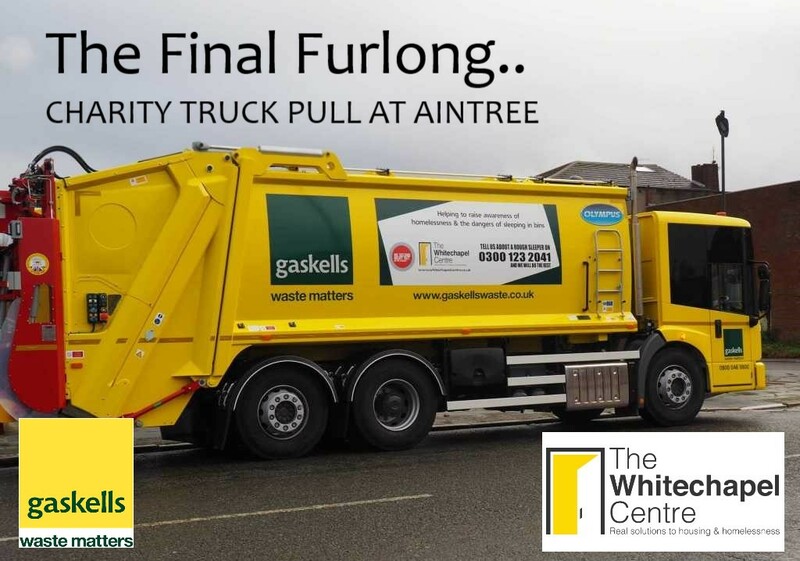 One of the biggest events is a spectacular truck tow at the world-famous Aintree Racecourse, which will see teams from Everton FC, Merseyrail, Pakawaste, Vehicle Weighing Solutions, Reconomy and The Jockey Club compete to pull a 17 tonne bin truck for half a furlong, in the fastest time. Roydon Recycling have donated a whopping £1,000 to the event as they can’t make it, but their donation will make a huge difference. 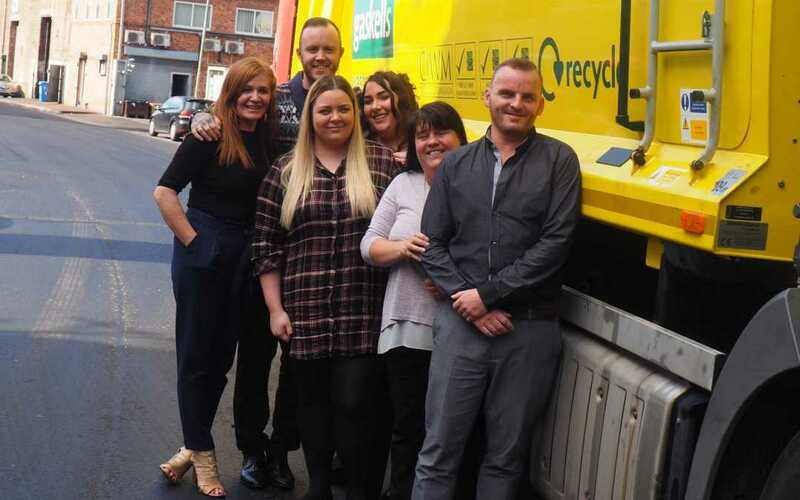 There will be a variety of activities taking place at Gaskells head office in Bootle over the four weeks, the first of which is the ever popular office fundraiser…swear boxes being installed in all departments. The boxes will be in place for a five day period, with two options. 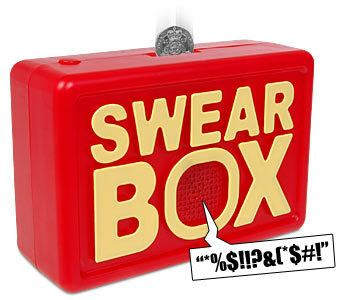 Staff can either pay £1 per day and swear as much as they like, or opt for 10p a swear word. There’ll be loads more going on across the month involving a special version Bake-off.. but involving pies, down to a number of the staff being from Wigan. Pies will be judged, and slices be put up for sale. There will be very strict rules on what constitutes a pie, tarts, hotpots and flans are not allowed, and everything has to be made from scratch. We will be asking the team for photographic evidence of their baking. Another event will be a lunchtime kickabout outside the offices with a Penalty Shootout. Six of the team from Gaskells are also taking part in this year’s Liverpool Sleepout on Friday 12th of October. All they’ll be supplied with is a sleeping bag, cardboard and onesies, and will be joining approximately 200 other people sleeping in the grounds of St James’ church near Liverpool city centre overnight. All of the action will be posted across our social media, as each event takes place, so stay tuned for how you can donate. Click here to take you to the page to sponsor our team who are taking part in the Liverpool Sleepout 2018.